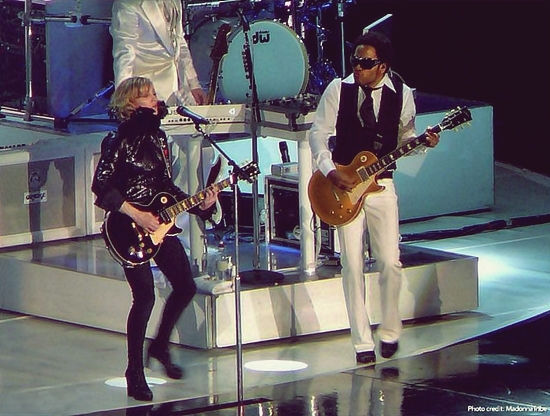 On August 31 2006, Madonna was joined on stage by Lenny Kravitz during a performance of I Love New York at a concert in Paris, France. Kravitz had previously been spotted in the audience at several stops on The Confessions Tour and was clearly a fan of the show. The appearance followed the pair’s 1990 songwriting collaboration, Justify My Love, and its pseudo-remix, The Beast Within. They also shared the stage during a performance of Ray Of Light at the 1998 MTV Video Music Awards. That must have been a brilliant performance of Kravitz’s hometown-I Love New York, the Confessions rocker is named! Madonna adores Lenny! Theirs is a mutual admiration society! Just seeing that picture with their twin Les Pauls makes me smile! I wonder if Gibson has an endorsement with them! May Kravitz and Ciccone Rock Hard Forever!